German Chancellor Angela Merkel said Monday that international sanctions imposed on Russia should depend on whether peacekeeping commitments signed this year in Minsk are upheld. 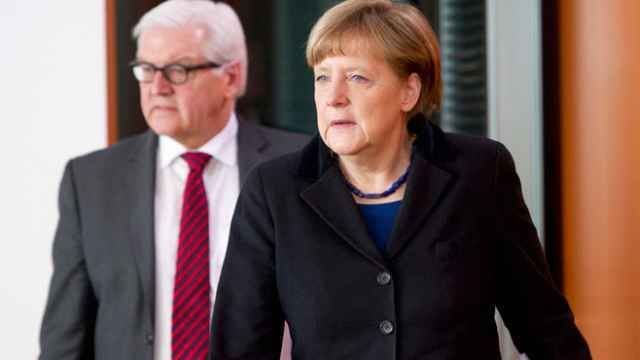 "During the European Council [meeting] in March we took an unambiguous decision that the sanctions were related to completing the Minsk agreements," Merkel told a joint news conference with Polish Prime Minister Ewa Kopacz in Warsaw. "It is clear that completing this package is taking longer. We will deal with this issue in June," she said. Kopacz said that Merkel agreed with her that sanctions, which have been already imposed on Russia, should be maintained. Merkel also said that only voluntary solutions for allowing in migrants from North Africa were possible under existing legal frameworks.